TWO CURIOUS GOTHIC LETTERS AND LOUIS HAMON, SILVERSMITH. 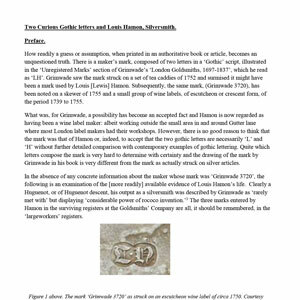 A short essay on a mark in the ‘Unregistered Marks’ section of ‘London Goldsmiths 1697 to 1837’ by Arthur Grimwade and the career of the silversmith Louis Hamon [Lewis Hamon]. This is a first draft and subject to further research…. previous post: FAMILY BUSINESS: ROBERT COLLIER, THE MASTER OF JAMES PHIPPS I, SILVERSMITH. next post: EDWARD ALDRIDGE I SILVERSMITH.